If you avoid extra sugar like I do, you might enjoy using granulated monk fruit sweetener in your granola. (Its pricey but delicious.) Turkeywoods Farms in Mystic, CT makes sweet syrup from shagbark hickory trees. (A mild honey would work well.) I finish the granola with a good dose of ground coriander. It’s subtle and unexpected. Cinnamon, a pinch of allspice and flax seeds would be great additions too, perhaps not all in the same batch though. Be sure to add spices and seeds when the granola is still warm after baking because they will stick better. I packed three Bonne Maman jam jars with this Almond, Cherry Coconut Granola and stashed two in the basement freezer out of reach. Bob’s Red Mill makes thick rolled oats that hold up well when cooked. I used it for the batch pictured. Jeanette, my internet friend, suggests these barley flakes, which are a brilliant idea for my next batch. Their large size and low starch content appeal to me. Preheat the oven to 300°F. Line a half-sheet pan with foil or parchment paper. Stir the rolled oats, almonds, coconut flakes and salt together in a large bowl. Whisk together the almond butter, oil, sugar and hickory syrup in a small saucepan. Heat the mixture, stirring occasionally, until warm and no longer gritty. Pour it over the oats. Using a rubber spatula, stir the oat mixture until evenly coated. Spread the oat mixture out onto the prepared pan. Bake for 20 minutes stirring the granola two or three times. Rotate the pan and bake for another 15–20 minutes, stirring a few times so it toasts evenly. 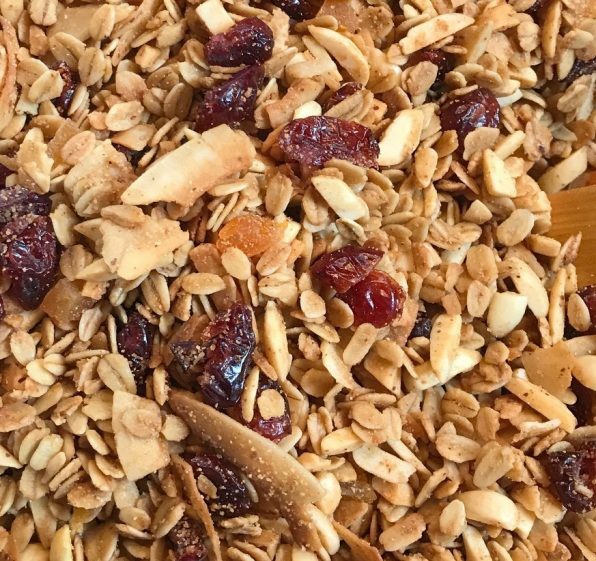 Dump the hot granola into a large bowl. Add the cherries, apricots and coriander. Stir well. Cool the granola completely before packing in jars.